Awesome adventure awaits your whole family when you visit LEGOLAND® Malaysia Resort! 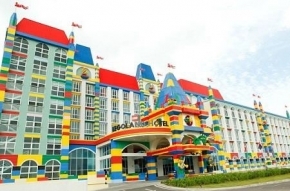 Enjoy a stay at the LEGOLAND® Malaysia Resort Hotel with 10% off room stay!! Also, get your 2-Day Combo Ticket at the price of 1-Day Combo tickets only for Hotel guests! Applicable to all room types. Subject to room rate availability. Advance booking is required 3 days prior to the date of arrival. Promotion is only valid for new bookings and cannot be combined with any other discounts, rebates or promotion. Promotion cannot be refunded or exchanged for cash and is not meant for any resale purposes. Cancellation of booking must be done 21 days prior to your arrival. Full cancellation charges apply for cancellation done less than 21 days prior to arrival date. Full payment of the entire stay is chargeable for no-shows. Check-in time is at 4.00 pm and check-out is at 11.00am. Maybank shall not at any time be responsible or held liable for any loss, injury, damage or harm suffered or incurred by or in connection with the use of the LEGOLAND Malaysia Resort’s goods or services.